Friends in Deed Food Pantry Manager Tim Nistler, Board President Richard Cheung, Executive Director the Rev. 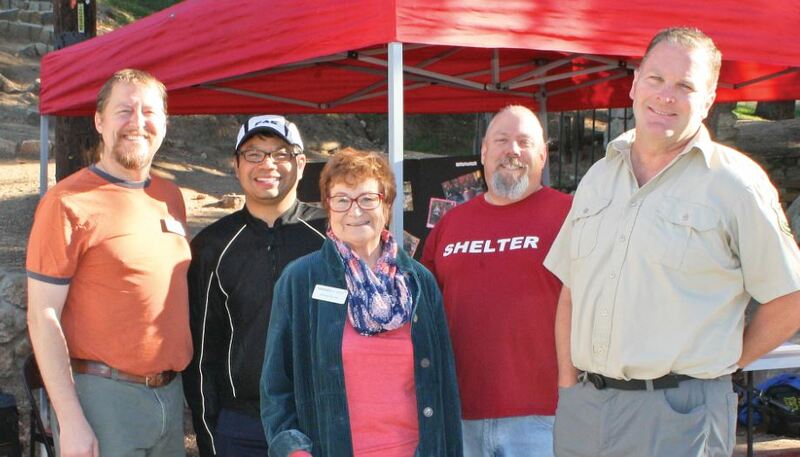 Donna Byrns, Bad Weather Shelter Director William Shelby and Mike Simms of Friends of Echo Mountain hosted “Hike for the Homeless” at Altadena’s Cobb Estate trailhead on Sunday. The event called on local hikers to donate used outdoor clothing and gear to aid those sleeping outdoors this winter. Mike Simms is no stranger to the elements. Between volunteering with the Forest Service, curating the Echo Mountain ruins and running Friends of Echo Mountain, a local preservationist group, Simms spends each of his days hiking the trails of the San Gabriel Mountains above Altadena. It was during these hikes that Simms realized he was sharing the forest with more than wildlife creatures and other outdoor enthusiasts: A number of homeless individuals were seeking shelter in the area as well. 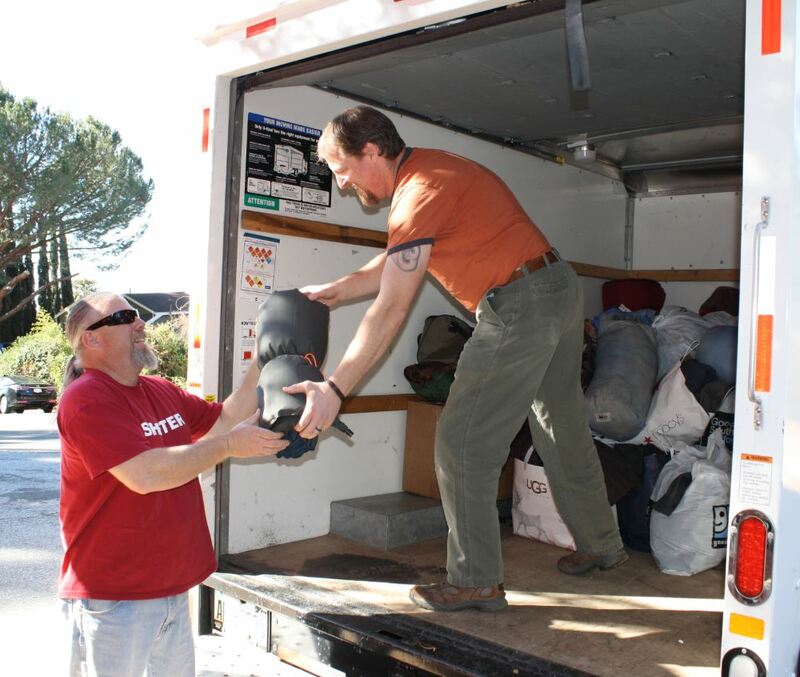 Fully aware of the bone-chilling overnight temperatures in the Angeles National Forest, he began to donate his used equipment and warm outdoor clothing to those he encountered. 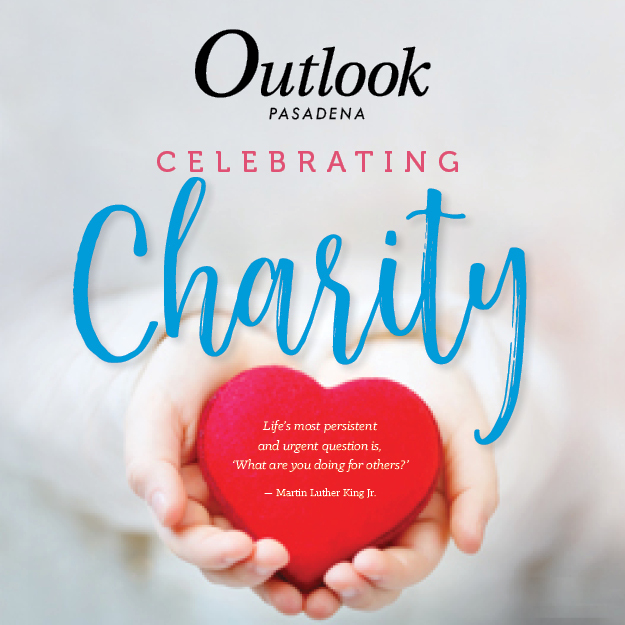 Simms approached the folks at Friends in Deed, a local nonprofit that provides housing, food and shelter services to Pasadena’s homeless population, and devised an event to bring the resources of the hiking community to the city’s most vulnerable residents. On Sunday, dozens of hikers heeded that call to action at “Hike for the Homeless,” an equipment drive held at the trailhead of Altadena’s Cobb Estate. 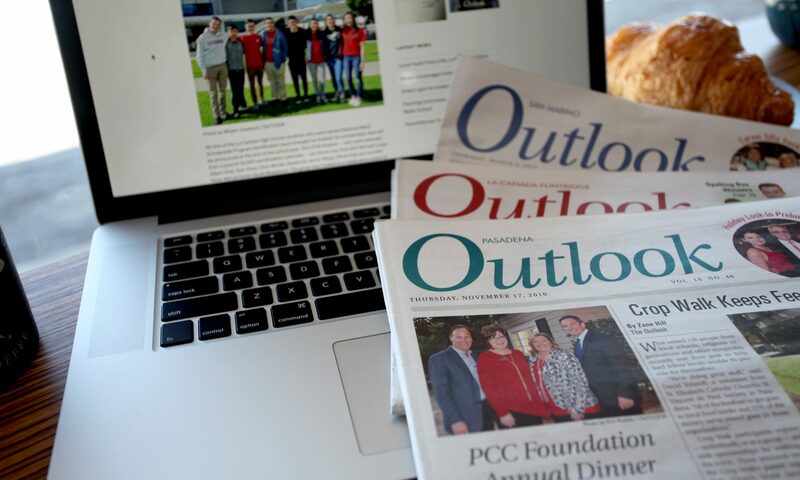 The event was promoted via the Friends of Echo Mountain Facebook page, where it quickly gained interest among hikers from Pasadena and across Los Angeles. William Shelby hands Tim Nistler a donated sleeping pad. The gear collected during Sunday’s drive will be distributed from Friends in Deed’s Bad Weather Shelter directly to the homeless population it serves. The first donors arrived before the event was even set to begin at 8 a.m. Volunteers from Friends in Deed had barely set up their booth and parked their box truck when early birds, bearing sleeping bags, pads, tents and backpacks, began loading it up. Over the course of the next few hours, the bounty grew as other hikers dropped off used gear before heading off onto the trail. Cars pulled up filled with bags of coats, jackets, thermals and other winter clothing. Some hikers who were unaware of the event stopped by the booth to make monetary donations. Others inquired about volunteer opportunities. 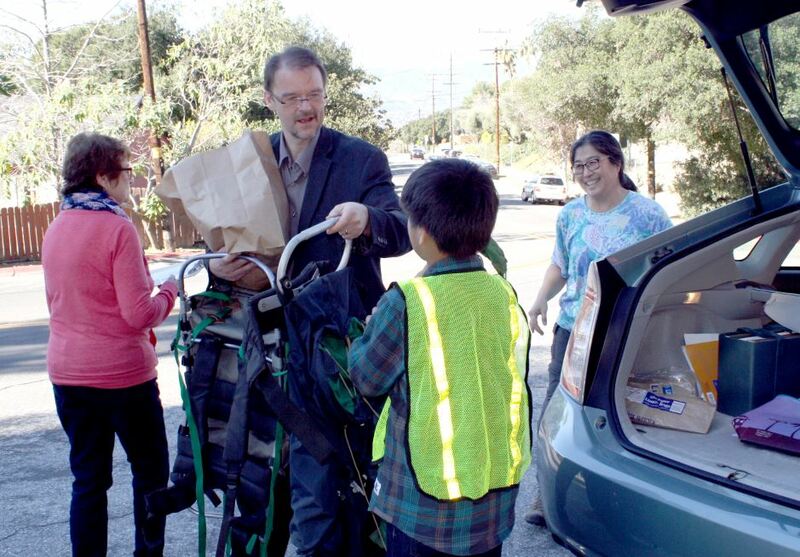 Pastor John Aitken helps Pasadena resident Deborah Hori unload some of her old hiking backpacks. Avid hikers often upgrade their clothing and equipment, making them an ideal resource for quality used outdoor gear. 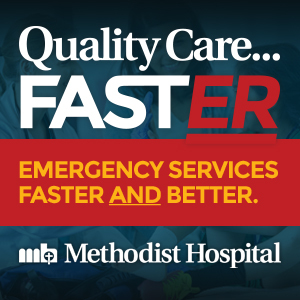 The clothing and gear donated at the event will go to Friends in Deed’s bad weather shelter, a weather-activated service that operates each year between late November and early March. When the temperature drops below 40 degrees or there’s a 40% or greater chance of rain, the shelter opens in the Pasadena Covenant Church gymnasium, where those seeking refuge receive a cot, a blanket, a hot meal and a place to stay for the night. Much of the donated equipment will be distributed directly from the shelter to those in need, while the clothing can be used immediately to provide for those coming into the shelter with a dry change of clothes. El Niño storms have already brought a surge in demand for such services this year, said William Shelby, director of the bad weather shelter. As the donations kept coming, it became clear that word of the event had brought together hikers from a diverse cross-section of the community. 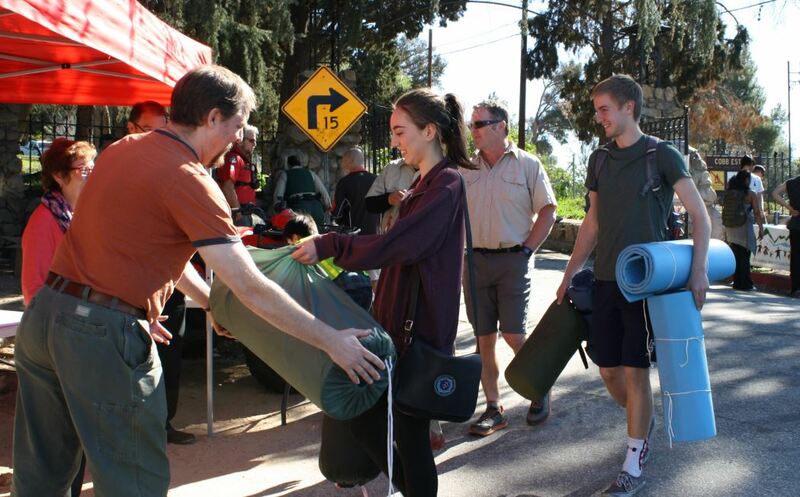 La Salle High School students Lauren Chacon and Patrick Madden, who carried armfuls of sleeping bags and pads up from their parking spot down the road, found out about the drive from their school hiking club. Pasadena resident Deborah Hori heard an announcement on public radio. La Salle High School students Lauren Chacon and Patrick Madden drop off some sleeping bags and sleeping pads before hiking to Echo Mountain. The teens heard about the drive through their school’s hiking club. In addition to a tax deduction, donors each received a coupon for 20% off the purchase of new gear at REI. The Arcadia branch of the recreational outfitter also donated 50 high-end sleeping bags and sleeping pads, all of which are returned products that have seen barely any use. Used sleeping bags cannot be resold in California, so rather than being shipped out of state and sold at used gear outlets, the generous donations will stay locally, where their quality and warmth can make a real difference to those at the mercy of the elements. Additional donations are still welcome and encouraged. For more information on how to support Friends in Deed and its programs, visit friendsindeedpas.org.